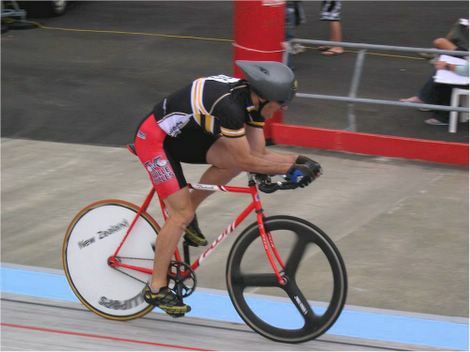 This is a shot from the NZ national track champs. 3000 metres for Vet2 (45 +) Its the same distance as Sarah Ulmer did.... just a good 35 seconds slower in my case! The helmet is the same one I borrowed off Jason Eady for the TT champs in Ashhurst, a LAS. I think the rear disc wheel is Christian Wengler's. Marcel Hollenstein won the event riding a particularly nice Dolan. Link here. 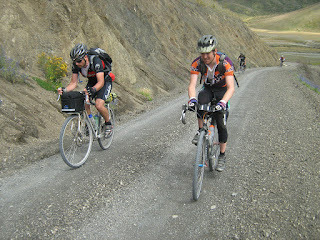 I started too fast and couldnt keep on top of the gear. I should have gone down 2 inches to accomodate for the rising wind but this was only my second ever IP so I am a bit green. Marcels time was 1.6 seconds faster than my 4.04. Still a big improvement on my previous other only IP, a 4.11 on the bumpy Wellington track.